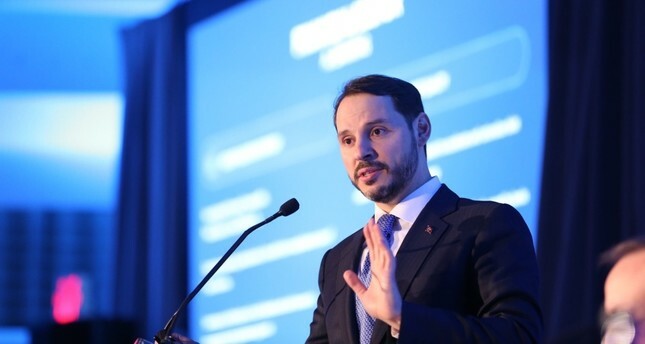 Treasury and Finance Minister Berat Albayrak presents Turkey's new reform package at a meeting with international investors, Wasghington D.C., April 11, 2019. Treasury and Finance Minister Berat Albayrak met international investors at a meeting organized by JPMorgan Chase in Washington D.C. ahead of the International Monetary Fund (IMF) and World Bank spring meetings on Thursday. During the meeting, in which Central Bank of the Republic of Turkey Governor Murat Çetinkaya also participated, Minister Albayrak presented the reform package unveiled on Wednesday. According to reports, some 400 investors attended the presentation. Late on Thursday, Albayrak tweeted: "We explained our Structural Reform Steps package and the economic policies of the new period at the investor meeting organized by JPMorgan." The finance minister also said he had held meetings in Washington with many international funds. During the weekend, Minister Albayrak is also expected to meet with other finance ministers and international investors. In addition to the financial sector, the second area reform efforts will concentrate on is inflation. In order to tackle food inflation, a new agricultural policy will be announced in May. With master plans for logistics, exports, and tourism, the country aims to increase revenues and support its development. Turkey's reforms in the upcoming period will also be implemented in the judicial sphere since the relation between a fair and effective legal system and strong and sustainable economic development is crystal clear. Following the IMF and World Bank meetings, the treasury and finance minister will also attend the 37th Annual Conference on U.S.-Turkey Relations with a theme of "Back to Business: Maintaining Partnership in Difficult Times." The three-day event, organized by the Foreign Economic Relations Board of Turkey (DEİK), the Turkey-U.S. Business Council (TAİK) and the American-Turkish Council (ATC), will discuss ways to reach a $75 billion bilateral trade target. An increase of Turkey-U.S. trade volume, currently close to $21 billion, to $75 billion has been one of the most-discussed topics in recent phone calls between President Recep Tayyip Erdoğan and U.S. President Donald Trump, who agreed to further enhance economic relations.